Since 1996, the Baker-Nord Center for the Humanities has enriched the cultural life of the university and the larger community, fostering scholarship across disciplines and making the fruits of that scholarship available through innovative public programs. Now, with support from the National Endowment for the Humanities (NEH), the center has embarked on a $3.2 million campaign to expand its activities, reach new audiences and offer faculty members access to the research tools of the digital age. The campaign began last December, when the center was awarded a $650,000 NEH challenge grant. To meet the challenge, the center must raise $2.6 million—four times the grant amount—by July 1, 2013. NEH also established benchmarks for each year of the grant period. For example, the center must raise $300,000 by July 31, 2009, to qualify for the first $75,000 in federal funds. Director Anne Helmreich acknowledges that Baker-Nord has never attempted a campaign on this scale. Then again, the center had never applied for a challenge grant before, yet its proposal won unanimous praise from NEH reviewers. No wonder Helmreich and her colleagues are confident they can achieve that 4-to-1 match. Helmreich's collaborators on the winning proposal were Mary E. Davis, the center's assistant director, Maggie Kaminski, director of external relations, and two colleagues from the office of the dean: Martha Gibbons, director of foundation relations, and Thomas Knab, the college's chief information officer. Early in the process, members of this team traveled to Washington, D.C., to meet with an NEH program officer. As Helmreich recalls, they didn’t receive much encouragement. The challenge grant category was "very competitive," they were told. For first-time applicants, the odds of success were less than 3 percent. And because NEH was facing budget cuts, no one knew how many grants would be approved. "We came out of the meeting with all of these statistics," Helmreich says. "It was all gloom and doom." After they left NEH, the team reassembled at Washington’s Union Station, where Helmreich had a few moments to "review everything and rally the troops." But once they boarded the train to Baltimore-Washington International Airport, they couldn’t find adjoining seats, so the conversation ended. Helmreich remembers sitting by a window and brooding for the first mile or two. "But then I thought, 'As bad as it looks, we really want to do this.' So I opened my laptop and started hammering out a draft outline. After we got to BWI, we talked about it. And that's what we started with—the draft we wrote at the airport waiting for our flight." From the outset, the proposal emphasized Baker-Nord's partnerships with local cultural institutions. This wasn't just a convenient selling point. Collaboration is a major theme of the gift agreement through which Eric and Jane Nord established and endowed the center more than 20 years ago. Through its relationships with, among others, the Rock and Roll Hall of Fame and Museum, the Cleveland Museum of Art, the Western Reserve Historical Society, the Cleveland Botanical Garden, the Cleveland Institute of Art and the Museum of Contemporary Art Cleveland (MOCA), the center creates public programs with broad appeal. Ultimately, Helmreich says, "NEH recognized that we are reaching an audience beyond the university—and, even more, that we are connecting the university to the community." The NEH award came in the midst of an especially active year for the Baker-Nord Center. In fall 2008, a series of programs devoted to "The Museum" began with an evening lecture by Adam Gopnik, art critic and contributing writer for The New Yorker. The crowd that filled Amasa Stone Chapel for Gopnik's talk included not only students and faculty, but also row upon row of guests from throughout Greater Cleveland. And because the center scheduled the talk to coincide with Alumni Weekend, Helmreich welcomed many graduates of the college who had just arrived on campus. In his lecture, "What is the Museum For? ", Gopnik explained how ideas about the museum’s social and cultural function have evolved since the 19th century, and how these ideas have influenced visitors' responses to works of art. Gopnik didn't bring any slides to illustrate his talk. But at various points, he gestured toward the Cleveland Museum of Art, whose illuminated façade was visible across Euclid Avenue, and whose architectural history since 1916 reflects the changing attitudes he was tracing in his remarks. Over the next several months, Baker-Nord and its visiting scholars considered the museum from a variety of perspectives. Classicist Stephen Tracy described how ancient Athens became "the leading force in Greek culture and, in a sense, the museum of the world." Legal expert Patty Gerstenblith discussed regulation of the international art market and the cultural repatriation of contested objects. Historian Stephen Conn looked at the audience for science museums and asked, "Where Have All the Grown-Ups Gone?" Kathy Coakley Barrie and Dennis Barrie, developers of the International Spy Museum in Washington, D.C., assessed the outlook for museums that operate as for-profit institutions. The center also joined with its neighbors in University Circle to conduct symposia on museum-related themes. "Teaching and Learning with Objects," a day-long event of special interest to K-12 teachers, began at the Cleveland Museum of Art and continued with afternoon tours of several University Circle institutions. With MOCA, Baker-Nord presented "Cool Fusion: Contemporary Arts and the Digital Humanities," a conference that Helmreich believes will inspire many future collaborations between the center and the museum. The Baker-Nord Center has recorded most of these events, which appear as videos and podcasts on its Web site. That is one aspect of the "digital humanities"—the dissemination of ideas and materials through the Internet and related technologies. As Knab points out, however, "digital humanities" also refers to the development of advanced research tools for humanities scholarship. In recent years, collections of rare manuscripts have been digitized and made available online. Historians have created and gained access to immense databases. Literary scholars have identified the authors of disputed works through computer-assisted stylistic analysis. Art historians have deployed new technologies to compare images at a level of detail that would have been unthinkable a decade ago. In its NEH proposal, the Baker-Nord Center pledged to make such tools available to humanities scholars in the College of Arts and Sciences. The grant provides partial support for a coordinator to help these scholars identify and deploy technologies relevant to their disciplines. One might think that junior faculty, trained in the latest research methods, would already be at home in the digital humanities. But in fact, Knab says, young scholars don’t always have time to explore technologies of potential value to their work; they may think such things will have to wait until after they get tenure. With the new coordinator’s support, however, faculty members at every level will be able to find their way around the vast "cyberinfrastructure" that universities across the globe are collectively creating. Within the College of Arts and Sciences, the Baker-Nord Center has ties to the departments of art history and art, classics, English, history, modern languages and literatures, music, philosophy, religious studies, and theater and dance. The list indicates the breadth of the humanities as a field of inquiry. How can a single center encompass it all? For Helmreich, the answer lies in collaboration. In her first two years as director, for example, she has worked closely with the Anisfield-Wolf Book Awards®, a Cleveland Foundation program honoring writers who explore issues of race and cultural diversity. 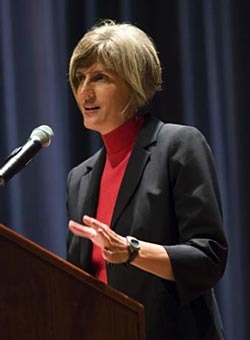 In 2008-09, the center and the foundation presented three public lectures by Anisfield-Wolf winners. Adrian Nicole LeBlanc, speaking to a Severance Hall audience that included first-year students from the SAGES program, reflected on her work as a journalist in an impoverished neighborhood in the Bronx. Scott Reynolds Nelson, a scholar of American history and folklore, gave a talk at the Western Reserve Historical Society, whose archives helped him trace the origins of the legend of John Henry. And novelist Mohsin Hamid, appearing at the Idea Center in Playhouse Square, explored connections between literature, religion and politics in a talk that was broadcast live to branches of the Cuyahoga County Public Library and to the Case Western Reserve campus. This is the type of programming that the NEH recognized in awarding the challenge grant to the Baker-Nord Center. "Your proposal was reviewed by humanities scholars with experience in long-range institutional planning," wrote outgoing NEH chair Bruce Cole. "In praising the Baker-Nord Center for the Humanities, these reviewers were especially impressed with the center’s strong record of collaboration with local cultural institutions. They found the wide range of programs to result from sound and thorough planning and to involve significant issues and intellectual perspectives central to the humanities." For 2009, the challenge grant campaign has received generous support from the Eric and Jane Nord Foundation, which will match all donations made to the Friends of the Baker-Nord Center. "We believe that alumni across the country will be interested in becoming friends of the humanities," Helmreich says. "They may want to make a gift in remembrance of a favorite professor they had in French or art history. We encourage them to help ensure that there will be opportunities for future generations to appreciate."